Many Ponton owners find that, along with the deterioration of the cardboard heater boxes, the ducts channeling the air from the rear of the heater box into the dashboard for distribution by the nozzles, have been badly damaged, are seriously deteriorated, or are missing. These air ducts are identical on each side of the car. Replacement ducts may be available from Mercedes, although they will be unpalatably expensive. When I obtained my 220S cabriolet, I found these ducts missing. To get myself up and running, as well as focusing my finances on more pressing Ponton needs, I bought a cheap, accordion-style tube from an on-line vendor the name of which I no longer recall. It more or less fit, and served the purpose, but it was obviously far from correct. It did not even fit neatly (see Photos 1 and 2). Photo 1. Incorrect, after-market air ducts served a purpose, but were less than ideal. Photo 2. Earlier replacement air ducts were unaesthetic. I decided that old-style heat exchange air ducts would be a workable and aesthetic substitute for the originals. The round metal piece at the rear of the cardboard heater box measured 60 mm outside diameter. Nothing I found came anywhere near that diameter, so I was rather flummoxed. I had to stay with the accordion tubes for longer than desired. After further searching, I stumbled upon a Volkswagen heat exchange air duct that was precisely 60 mm inside diameter. They were long enough as well (see Photo 3). Photo 3. Affordable alternative using VW heat exchange air ducts. 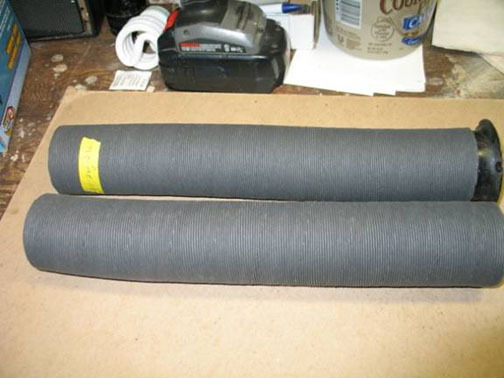 The Volkswagen part number for the tube, which is 25.75 inches in length is: 211-261-235A. 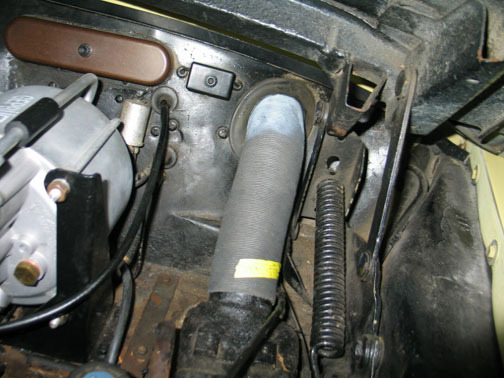 The Volkswagen part number for the same tube that is 16.375 inches long is: 211-261-236A. These items were apparently no longer available from Volkswagen dealers. However; several aftermarket vendors still had stocks of these tubes. Only needed to perform a brief internet search to locate them. I bought the 16-inch version (211-261-236A) and cut off about four inches for my cabriolet. I don't know of the original ducts on sedans were longer or shorter than the ducts on the coupés and cabriolets. I am pleased to report that these heater ducts fit perfectly on my Ponton cabriolet, and looked good. Photo 4. 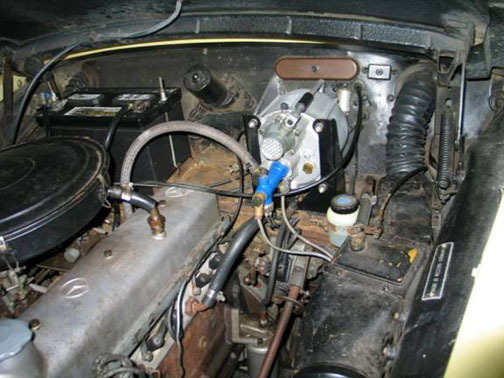 Left side – the VW air duct installed in my 1959 Mercedes-Benz 220S Ponton cabriolet. The yellow sticker showed the part number. 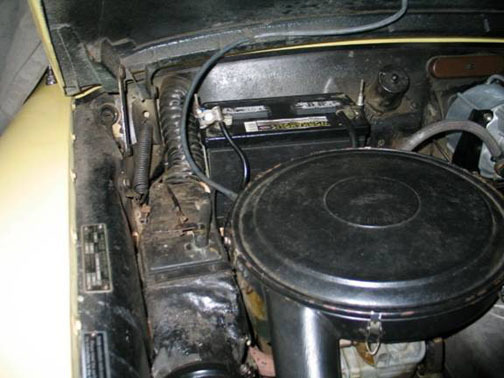 Note that the discoloration at the upper part of the duct (see Photo 4) came from the use of white lithium grease as a lubricant to aid in sliding the tube into the dash and onto the distribution ducts inside the dash. This was found to be an obvious mistake but I never got around to replacing the ducts before the car was sold.